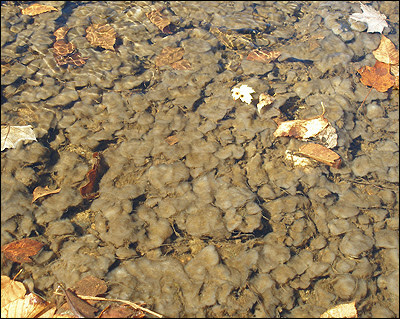 Way Upstream posted twice about invasive species issues in 2007 (Invasive Algae and Aquatic Hitchhikers) . National Public Radio covered the "Rock Snot" story recently which has given the invasive species problem more needed national exposure. Click here to read the Morning Edition story from 12/31/07. Click here to listen to the NPR broadcast. The broadcast is about 4 minutes long. Be sure to wait a few seconds after the 12 second intro for the broadcast to start. Listen and share your thoughts. A rock snot bloom (Didymosphenia geminata- "Didymo") can cover a stream from bank to bank and reach for miles. Twenty years ago, the algae was found only in isolated mountain streams in western Canada. But a more aggressive version has spread to streams in the western United States and to the East Coast. This stuff is gnarly. It's gotten ahold of the little truckee river. It's already affecting the hatches. It changes the whole ecosystem and insect diversity of a stream bed. Not to mention makes some places un-fishable without trying to clean your tippet each cast. I don't know what the answer is, just try to do your part not to spread it. I know rubber boot souls retain allot less particulates than felt. all kinds of stuff can get into that felt and live in the damp felt in the back of your truck for weeks. Just a thought. Thanks for the comments Mikey. I don't know the answer to eliminating Didymo or it's spread either but it's clear that "rubber souls" spread less stuff. Gear rinsing is also a measure we all need to practice....at least for freshwater. So far it seems like these nasty buggers don't like the salt. Hello there. This comment has nothing to do with the last post and i apologize for that. I need some help with product info. I want a hip pack and i always prefer patagonia products. Unfortunately, the pics on the website and product description do not do it for me. I have been looking the fishpond and William Joseph (both have several pics and extensive product info). So you guys out there, what do you think? I believe i will go with patagonia but i wonder, how is the water bottle holder? Can it hold a standard Nalgene? PS: EL pescador, maybe you have pictures of people wearing it an with a water bottle. PS2: I apologize if this kind of quiestion is not appropiate for this blog. No worries Pantxo. Patagonia has two options within the fishing line. They are the Hip Chest Pack and the revised Double Haul. The Hip Chest Pack is a tried and true classic and it has a water bottle holder on one end that will hold standard sized Nalgene style containers. I'm sure there are readers out there who have this style. Chime in with your comments please. The other option is the Double Haul. It holds a standard sized hydration resevoir and is also modular. It can also hold containers within the two packs. You can see a few images of this style in the Double Haul videos. I have used hip packs and the Double Haul. I think you need to decide if you really are going minimalist, go with the hip pack (if you need more water, simply carry one of the Camelbacks that is just a water carrier, not a full on pack). If you want to go a little heavier with gear the Double Haul works well. Has the hydration capability as El Pesco mentioned and still forces you to go somewhat lighter than some of todays vests. Also, it can carry a light jacket and the rod carrier works well when you do need to hike a ways to get to your sweet spots. Thank you El Pescador and big sky taku for your comments. I decided to go with the patagonia hip pack. I do need something minimalist since we rarely use all the things we have in our vest and i think i will have greater freedom of movement and less sweating. Also i want to try something new. So i made the order, i will let you know. great advice, I am in the same desicion making process my self. Hey El Pescador... when will the new Patagonia fly fishing gear be available for purchase? I have been kinda holding out a little for the new stuff. The S8 gear is arriving daily. New gear will continue to arrive over the course of the next two months. What in particular are you looking for? I am interested in the new Double Haul for sure. What is the list price on that? where can I see close up pictures? I would like to read a product description. and where can I get one? I don't see anything new in the Fly Fishing line on the Patagonia website yet. In the first double haul video, is the last image at the end of the video the new double haul or a new hip pack? Speaking of S8, are the sol patrol pants coming back ? JVK - The Double Haul retails for $125. It will be in stores soon. 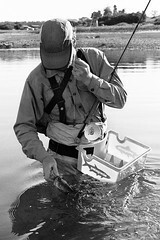 You will be able to find it at most Patagonia Fly Fishing Dealer locations and at www.patagonia.com/flyfishing. Let me work on your product description and close up request. Stay tuned. Mark - What you are seeing in that last video shot is the back portion of the Double Haul being worn solo as a hip pack. Spottedtail - The Sol Patrol pants are in the S8 product line. Colors are Retro Khaki, Low Tide and Alpaca Brown. Noticed on on of your latest pictures something what to me looks like a full waterproof Hip Chest Pack? The pack in that image is an early prototype of a Stormfront Hip Pack. Patagonia just released it as part of their 2011 collection. Expect to see it on the shelf early next year. Let me know if you have any further questions Tom. Thanks for checking in. Thank you for your answer. That really sound interesting! Any details you can share with us, like size, color? I was planning to purchase the Sage DXL Typhoon Waist Pack - Large, but it is only partial waterproof as I understand it. I'm not 100% sure where the pack landed after I left Patagonia so pix of my proto are probably inaccurate, at least in part. You may want to check with a dealer in your area who has seen the 2011 line. My proto was a completely welded, waterproof bag similar to the Stormfront Pack (same zipper). I expect the production bag still reflects those attributes. Can any of my Patagonia friends chime in? The Stormfront Fanny will be part of the spring 2011 line, should be available around the first of the year. Should be fairly close to the proto that El Pescador was using in the picture. It's a simple bag, one main compartment with some simple internal organization and the same waterproof zipper and fabric found on the pack. Thank you for your feedback. I will watch the Patagonia website closely. Thanks for the update B2. I'd be happy to feature a post on the pack whenever you think the time is right. Let me know. Tom, the Patagonia web site probably won't show this pack until sometime in January. If you need to make a decision before that let me know. I'd be happy to discuss things further. In the meantime, maybe some of my friends at Sage could weigh in on the Typhoon Pack as well?